1. Rinse and cut up the cauliflower into sizeable chunks. Using a hand grater, grate the florets until they are rice-sized. This can also be done in a food processor if available. 2. Add the cream, butter, onion powder and lemon juice in a large pan and bring to a simmer. 3. Next, add the cauliflower and simmer, stirring frequently for 10-15 minutes. 4. Grate the parmesan cheese over the mixture, or add the vegan mix, and let it melt while stirring the contents. 5. Season with salt and pepper. 6. 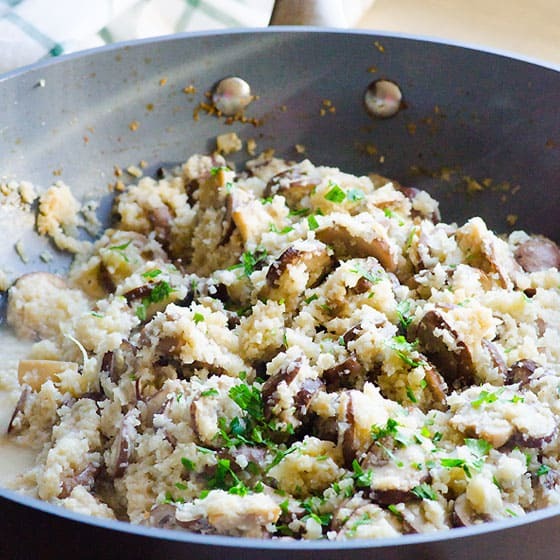 While the cauliflower risotto is simmering, in a separate frying pan melt some butter and add the mushrooms and garlic until golden, seasoning with salt and pepper. 7. Remember to try the cauliflower risotto regularly to ensure it is to your taste and not over-done. 8. Once ready, serve the risotto on plate and scatter the mushrooms on top with the freshly chopped herbs and extra parmesan to preference. Top with roasted pine nuts and sprinkle with olive oil. This recipe was taken from Anne Aobadia, Emma Shevtzoff selection on line at the Diet Doctor .